"Make it a habit to tell people thank you. I just wanted to take a minute during this thanksgiving weekend to give a shout out to everyone. Thank you for being a part of my life, be it a major role or a brief connection, I am thankful our lives have touched. Some have heard me relate this before, especially when i sent one of these quartz crystals their way. As you know one of my favorite places to go is Cape May. one of the things it is famous for are Cape May Diamonds. The Kechemeche Indians were the first to find the fascinating and beautiful stones. They believe that these curious stones possess supernatural power bringing success and good fortune. Earlier settlers stopped at the beaches because they believed diamonds glistened on the shore. These crystals turned out to be white quartz. Naturally you find these rocks in a cloudy murky white state, but Cape May has the right elements, outside forces, to work on these rocks. The break of the waves, the temperature of the water, the salt and grit of sand that effects them and they are transformed. Just reminds me that we don't reach the shore alone, we are touched by so many. Look around you when you are celebrating this weekend and during the upcoming holidays and remember to thank those that have had on influence on your life. Thank them for helping you become a gem! There are a few people who have influenced me during my younger years. One of them was Mrs Maxon, My third grade teacher. I remember clearly everyday after recess we would come back to class and rest our heads on our desks while she read us a chapter from a book. She introduced us to Charlotte’s Web; Otherwise Known as Sheila the Great; The Lion, The Witch, and the Wardrobe; A Mouse Named Ralph; and A Wrinkle In Time. By doing so she awoke an avid reader in me. Once she read a book I wanted to read more by the author. And through these authors an imagination was fed and creativity inspired. 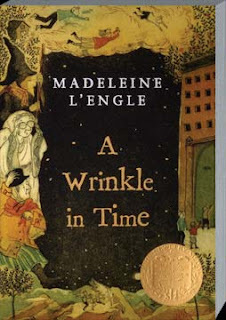 As you can see from the titles she introduced me to one of my favorite Authors, Madeleine L’Engle. Her ability to create worlds and make you feel a part of them as you read was astounding. There was always a character you could relate to and you felt there was someone out there that understood you. I remember burning through the pages of her books, First, the Murray Family and then the Austins. Yesterday I was perusing the web, looking for a Christmas gift for my friend Mechele, who is also a fan of Madeleine L’Engle, when I came across her website and was saddened to read she had passed away this September. Although her life star has gone out its light will shine for generations as children continue to have their imaginations fed by her words. And She may never know how many stars she helped ignite by sharing her gifts and inspiring some not only to pick up a book and read but to pick up the pen and write. Rest in Peace Madeleine L’Engle. The universe is brighter and larger because you lent it your light! And Thank you Mrs Maxon for introducing me to more than the cookie cutter textbook knowledge and let my imagination grow! Just a quick hello. Rissa and I are in the midst of tackling two stories. And at the moment I really do feel like I have a split personality. Both heroines have such different personalities and ways of facing troubles. Bess is a vivacious little thing who when isnt pleased is found with her hands on her hips and her toe tapping. She is also often found with her chin up in the air, stubborn to the core. She is determined to give her man Colm a very hard time. Then there is Agnes, very withdrawn and internalizing the emotions caused by all the horrid things going on in her life. You'll find her focusing on some distant spot instead of looking you in the eye, a stoic expression on her face and her fingers nervously twisting her ring. Will Gryffen be able to work his way passed the walls she has put up and let her experience the pleasure life with him can offer? We'll see. It takes me a bit to step out of one pair of shoes and into the other. After writing a scene for Agnes, my husband kept asking me what was wrong, I seemed sad. I thought for a moment then laughed I had to assure him there was nothing wrong. It was Agnes. I hope you all get the chance to meet both these ladies and travel with them on their journey toward a happily ever after. Hugs and wishes for everyone to find the someone special to be thankful for.